Sorghum vulgare Pers. There are numerous synonyms for Sorghum bicolor (see GRIN for an exhaustive list). 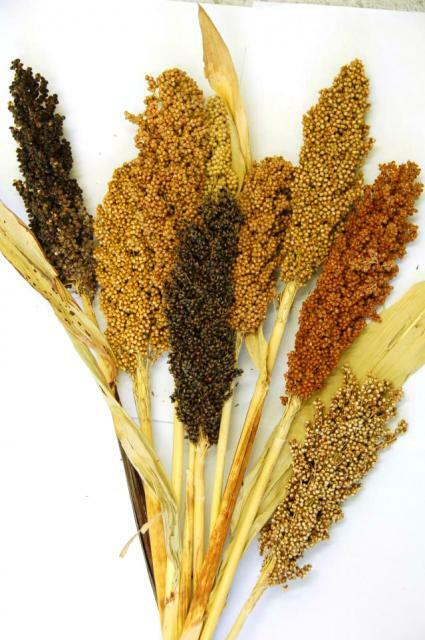 Sorghum (Sorghum bicolor (L.) Moench) grain is the fifth major staple cereal after wheat, rice, maize and barley. It is cultivated worldwide in warmer climates and is an important food crop in semi-arid tropical areas of Africa, Asia and Central America. Sorghum grain is a small, hard caryopsis covered by glumes. In grain sorghum, panicles are compact and bear 25,000 to 60,000 seeds/kg. Forage sorghum yields 120,000-160,000 seeds/kg. The whole grain can be boiled, roasted, popped or ground to make flour for baking (flat breads) and pastry. Sorghum grain is used for the production of alcoholic beverages, including beer and liquors. Some sorghum varieties are used for dyeing textiles or leathers (Ecoport, 2009). In animal nutrition, grain sorghum is mostly used as an energy source and is a good feedstuff for poultry, pigs and ruminants. The stalks remaining after harvest can be grazed as some varieties stay green for a long period of time. Sorghum may also be grown for fodder, for grazing or cut green to make silage and hay (see the Sorghum forage datasheet) (Balole et al., 2006). Kafir sorghums, originated from South Africa, with thick, juicy stems, large leaves, and awnless cylindrical-shaped panicles. Seeds are white, pink or red and medium in size. 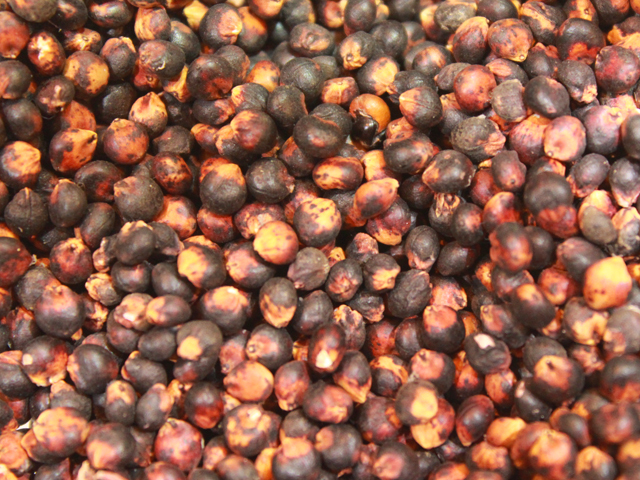 Milo sorghums, originated from East Africa, have less juicy stems than the Kafir group. Leaf blades are wavy with a yellow midrib. Heads are bearded or awned, compact and oval in shape. Seeds are large, pale pink to cream in colour. Plants tend to be more tolerant to heat and drought than the Kafir group. Feterita sorghums came from Sudan. Leaves are sparse in number. Stems are slender and dry. Panicles are compact and oval in shape. 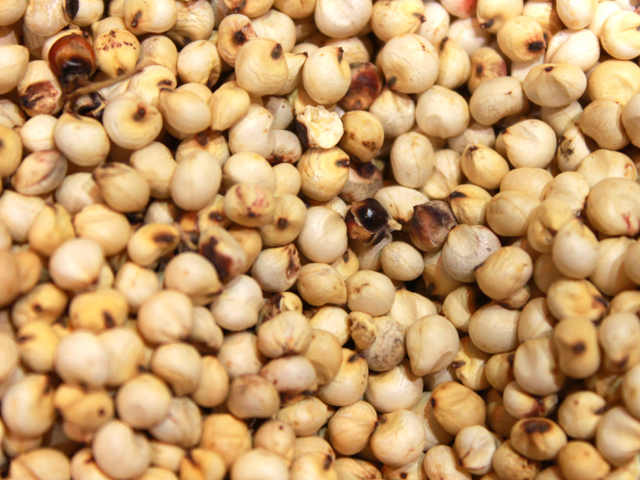 Seeds are very large for sorghum and chalky white in color. Durra sorghums are from the Mediterranean Area, the Near East and Middle East. Stems are dry. Panicles are bearded, hairy and may be compact or open. Seeds are large and flattened. Sballu sorghums from India have tall, slender, dry stems. Heads are loose. Seeds are pearly white in color and late maturing, thus requiring a relatively long growing season. Koaliang sorghums, typical of those mainly grown in China, Manchuria and Japan, have slender, dry, woody stems with sparse leaves. Panicles are wiry and semi-compact. Seeds are brown and bitter in taste. Hegari sorghums from Sudan are somewhat similar to Kafirs but have more nearly oval panicles, and plants that tiller profusely. Seeds are chalky white. In the United States most varieties have been derived from crosses involving Kafir and Milo. These 7 groups can cross-pollinate to give many hybrids. The germplasm of sorghum is enormous: the International Crops Research Institute for the Semi-Arid Tropics (ICRISAT) in Patancheru, India, keeps a collection of 36,000 accessions from all the major sorghum-growing areas of the world (Balole et al., 2006). 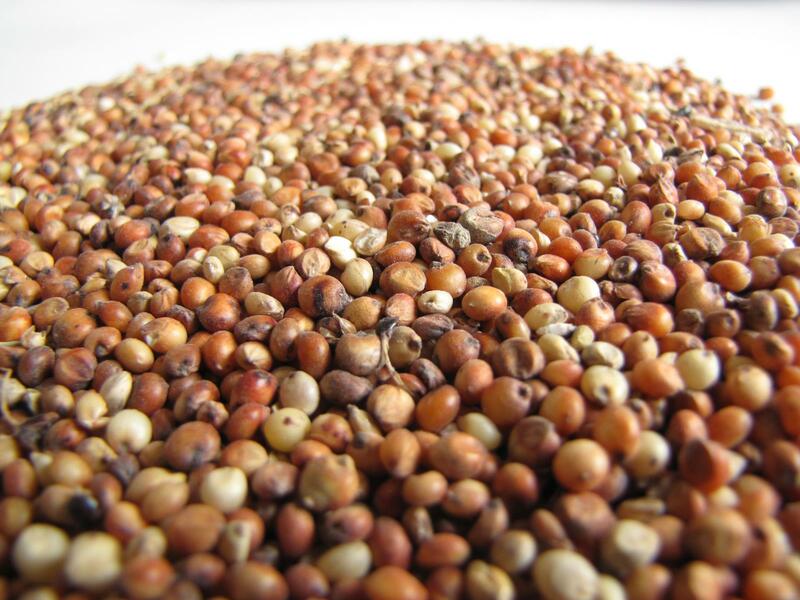 Sorghum is native to East Africa, possibly to Ethiopia (Ecoport, 2010) and it is thought to have been domesticated around 1000 BC (Balole et al., 2006). It is now widespread between 50°N (USA and Russia) and 40°S, and from sea-level up to an altitude of 1000 m (Ecoport, 2010). Optimal growth conditions for sorghum are 25-30°C at seedling and 30°C day-temperature during growth, 400-750 mm annual rainfall on deep, well-drained loamy clay with a pH between 5.5 and 7.5. Sorghum is tolerant to drought because of its root system. It performs better than maize during drought and occupies areas unsuitable for maize in stress-prone semi-arid areas. It is tolerant of salinity and to some extent to waterlogging for a short period. It is sensitive to frost and to sustained flooding. It is susceptible to weeds during its early stages of development. In Africa, Striga hermonthica, a parasitic weed, attaches itself to the roots and is particularly noxious to sorghum (FAO, 2009). The grains have to be processed before being fed to cattle, or else a large proportion of them will be swallowed whole and the waxy bran covering the grain will make digestion difficult. Grinding is the simplest, least expensive method of preparing sorghum grain for cattle; other methods include dry-rolling, steam-rolling, flaking and popping. All methods produce end products with different degrees of digestibility. Green matter yields are about 20 t/ha (Balole et al., 2006), but may reach 75 t/ha under optimal growing conditions (FAO, 2009). Average yields of grain range from 0.5 to 0.9 t/ha in Africa, 2.3 t/ha in China and 3.6 t/ha in the USA (rainfed sorghum), or 4.5 to 6.5 t/ha from hybrid types under irrigation (FAO, 2009). Grain sorghum can be a high productive crop that requires adequate amounts of NPK fertilizer, with potentially deleterious effects on soils and groundwater. However, under harsh economic conditions, it may be cultivated in rotation with a legume crop benefiting from the nitrogen provided by the legume. After harvest, ploughing in the stubble can improve the organic matter status of the soil and help limit erosion. When sown in 20 cm rows, sorghum gives good protection from soil erosion. As a drought-tolerant species, sorghum improves water use efficiency while supporting relatively high levels of production in dairy cattle. Sorghum is tolerant of many pollutants and it thrives in toxic soils that kill most plants. Because of its penetrating root system, sorghum also captures the nitrogen which may be in excess in the soil, a property that has been useful in reclamation of fallow lands, where wastes have been discharged, and where soil N was very high (400kg/ha). Sorghum also thrives on salty irrigated soils: it restores the porosity of the soil making it possible to grow a high yielding wheat crop in one season (NRC, 1996). 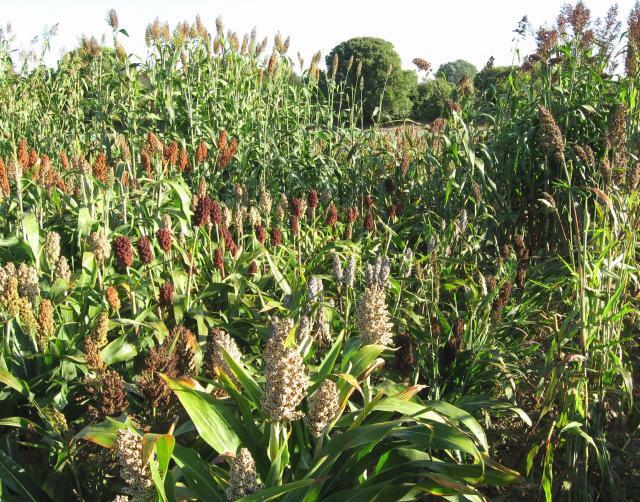 Sorghum can be used as a cover crop during the fall and winter: sown during the fall, it covers more than 60% of the soil before winter and protects it from wind erosion. It also helps through sparing more water than other cover crops because it dies quickly after the first frosts and does not withdraw water from the soil. After harvest, ploughing in the stubbles can improve the organic status of the soil and limit erosion (UC SAREP, 2006; NRC, 1996). Sorghum has some detrimental effects on broad-leaf weeds, which are still effective after the sorghum has died. This could be due to phenolics and cyanogenics released by the sorghum roots that hinder weed growth (NRC, 1996). Dead stalks of sorghum grain can provide support to climbing legumes several months after the grain is harvested (NRC, 1996). 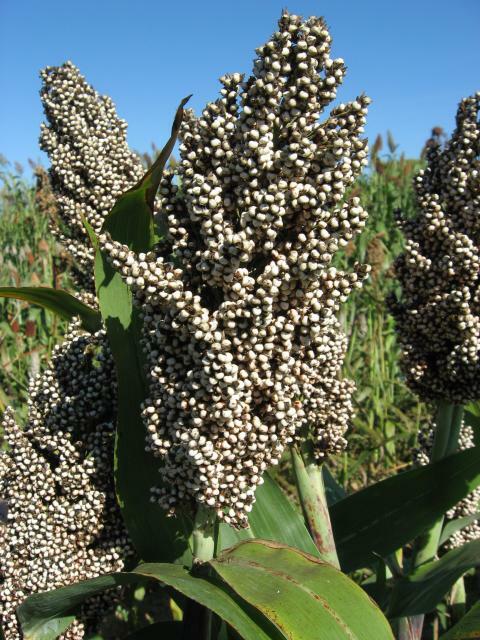 Grain sorghum is mostly used as a cereal grain energy source and is a good feedstuff for poultry, pigs and ruminants. Its composition is roughly similar to that of maize and it is particularly rich in starch (more than 70% of the dry matter). Crude protein content in sorghum grain ranges from 9 to 13% DM and is slightly higher than that of maize, though much more variable depending on growing conditions. Like maize, it has a low lysine content and its utilization may require amino acid supplementation. Fat content is also slightly lower in sorghum grain than in maize. Sorghum grain is devoid of xanthophylls and 70% of its phosphorus is bound in phytate (Sauvant et al., 2004). High-tannin or “bird-resistant” sorghums. Those sorghums can be recognized because of a pigmented testa situated below the pericarp. 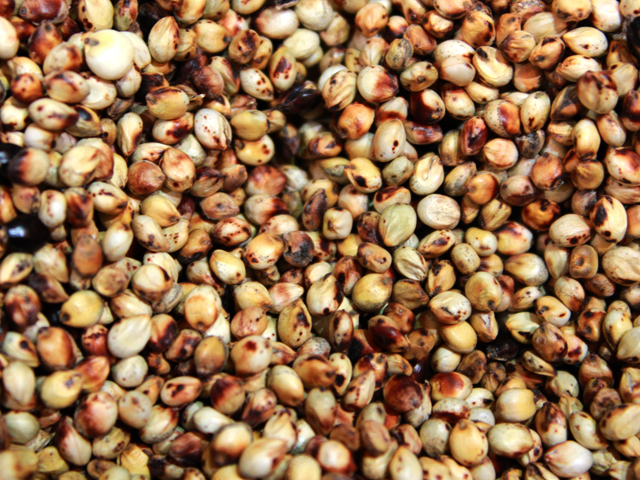 Samples of sorghum grain are assessed by the “Bleach test” which removes the pericarp and make the pigmented testa turn black while the unpigmented testa remains light coloured. Due to breeding efforts aiming at eliminating sorghum tannins, the majority of sorghums currently produced are tannin-free in the USA (99% of the production), Europe (Vignau-Loustau et al., 2008), Australia, India and Thailand (Awika et al., 2004; Subramanian et al., 2000; Walker, 1999). However, in countries where bird predation is an important issue, the use of low-tannin sorghums may not be economically advantagious and the use of high-tannin cultivars is likely to remain important (Kyarisiima et al., 2004; Taylor, 2003). In Eastern and Southern Africa, traditional sorghum varieties of moderate tannin content are widely grown for staple food and alcoholic beverages (Awika et al., 2004), though there are local variations. For example, varieties containing tannins are common in Niger and Senegal, but only rarely grown in Mali and Burkina Faso (Abdoulaye et al., 2006). In Southern Africa, small-scale farmers intercrop tannin and tannin-free sorghums in areas prone to high bird predation in order to reduce grain losses (Awika et al., 2004). In Argentina, varieties with tannins are still cultivated (Massigoge et al., 2002). In poultry, tannins are known to reduce growth rate, egg production and protein utilization, and to damage the mucosal lining of the digestive tract. Increasing protein content or amino-acid levels in the diet may alleviate the deleterious effects of tannins. In pigs, feed intake and growth rates are also reduced by high-tannin sorghums, with feed efficiency being reduced by between 5% and 10% compared to that with low-tannin sorghum. In ruminants, the effects are less negative since condensed tannins are complexed and precipitated by the rumen microflora (Reed, 1995). The remaining active tannins may have beneficial effects, such as bloat prevention and increasing the amount of by-pass protein (Waghorn, 2008; Reed, 1995). High-tannin sorghums have been found to have antioxidative activity within the beef cattle muscles and are able to enhance meat quality (Reed, 2008). Reconstitution followed by anaerobic storage. Formaldehyde treatment, acid treatment, NH4OH, NaOH, K2CO3, CaO, urea (Russell et al., 1989). Providing greater amounts of amino-acid in the diet: 0.15% methionine (Armstrong cited by King et al., 2000), or a mixture of choline and methionine (Daghir, 2008). Sorghum ergot is a fungal infection caused by Claviceps sorghi, which produces alkaloids. Several observations in Australian piggeries have reported feed refusal, low milk production in sows and subsequent loss of litters when diets were based on grains containing 1% to 20% sclerotia. In cows, 20% sclerotia caused a drop in milk production. In poultry, 5% sclerotia induced respiratory difficulties, diarrhoea and death. No effect were noticed at 1.25% sclerotia. Sorghum ergot problems can be prevented through an appropriate visual inspection of the sorghum grain (Bandyopadhyay et al., 1998). Like maize, sorghum is susceptible to various Fusarium spp. Mycotoxins such as aflatoxin, ochratoxin, zearalenone, deoxynivalenol or fumonisins may thus occur (their effects on livestock are fully described in the Maize grain datasheet). However, fungal attacks in sorghum are less frequent than in maize because sorghum grows in warmer and drier climates than maize. Moreover, when Fusarium is present in sorghum it produces much less fumonisin than in maize (Visconti et al., 1994). Sorghum grain is palatable to cattle and its nutritive value is comparable to that of maize (Piccioni, 1965). Kafirins (proteins found in sorghum) make starch digestion more difficult; in the rumen, sorghum starch is less degradable than that from wheat or barley. This low rumen starch degradability may be beneficial compared to other cereal grains because its lower fermentation rate make it less acidogenic in the rumen. However, low rumen degradability also means that higher amounts of starch escape from the rumen, reach the intestine and may be lost in the feces (Sauvant, 1997). As a result, the overall energy supply is reduced and sorghum grain provides less energy than maize (Laurent, 1988). In high producing cattle (steers from feedlots and high producing dairy cows) that have high energy requirements, there have been several attempts to increase starch degradability, relying on the fact that slowly degrading starches can be sensitive to processing (Offner et al., 2003). Steam-flaking appeared to be the best way to increase energy level (Oliveira et al., 1993). Net energy for lactation is 20% greater for steam-flaked sorghum than for dry-rolled sorghum (Theurer et al., 1999). Milk yield and milk protein yield are higher since steam flaking can improve the cycling of urea, the microbial protein flow to the small intestine and the mammary uptake of amino-acids (Theurer et al., 1999; Santos et al., 1998). However, the cost of this process may make it economically suitable only for high-producing cattle, as less expensive methods, such as coarse grinding, dry- and steam-rolling give good results. Grazing stocker calves supplemented with sorghum grain had higher daily weight gain. Dairy cows grazing Chloris gayana and supplemented with sorghum grain gave less milk protein during summer (Moss et al., 2000). In dairy heifers, even though the feed efficiency of sorghum was lower than that of maize (Hamman et al., 2001), a diet with 30% sorghum concentrate was significantly cheaper than with maize (Reddy et al., 1995). Feeding lambs and calves with processed sorghum grain rather than with whole grain had no effect on growth. However, in calves and kids, pelleted grain gave a higher feed to gain ratio (Economides et al., 1990). Sheep can be fed whole grain or coarsely ground grain sorghum (Piccioni, 1965). 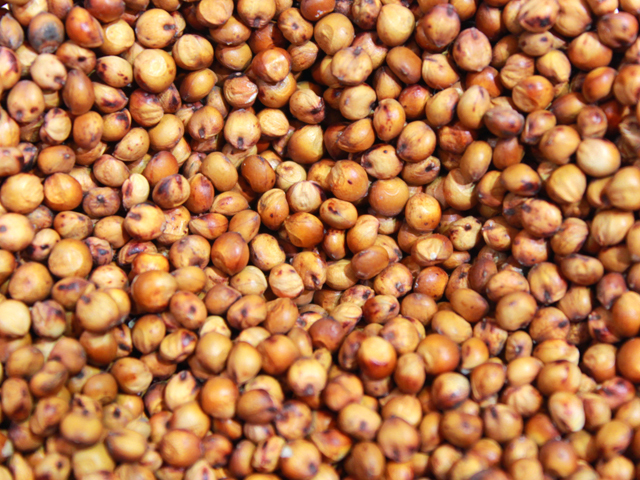 Low-tannin sorghum grain has an energy level identical to that of maize grain for pigs. Amino acid digestibilities of low-tannin sorghum are slightly lower than those of maize (Sauvant et al., 2004). In growing pigs, high-tannin sorghums were reported to have a lower energy and protein digestibility than low-tannin sorghum (Cousins et al., 1981). High-tannin sorghums may also affect meat flavour (Hansen et al., 1973). Low-tannin sorghum can be included at 60% of the diet in weaned pigs between 9 and 25 kg, and up to 75% in growing finishing pigs if properly supplemented with soybean meal, vitamins and minerals (Jacquin, 1991). Sorghum grain can be roll-milled or hammer-milled in order to reduce particle size and thus enhance digestibility. In starter pigs, hammer-milled sorghum (650 µm) allowed a better performance than roll-milled sorghum (1 mm) (Walker, 1999). Pelleting sorghum grain resulted in good animal performance provided that there were no fines in the diet (Stark et al., 1993). Extruded sorghum grain improved growth in young weanling pigs (0 to 10 days after weaning) and finishing pigs but not in older post-weanling pigs (Richert et al., 1992; Hancock et al., 1991). Sorghum is of utmost importance in poultry feeding in countries where it is available. Sorghum grain can be fed as the main or only grain in poultry diets. Broilers can be fed up to 70% low-tannin sorghum in combination with soybean meal, minerals and vitamins (Jacquin, 1991). Low-tannin sorghum has a metabolizable energy comparable or higher to that of maize (Sauvant et al., 2004), and can replace maize grain to a great extent (Subramanian et al., 2000) even if a meta-analysis of literature on sorghum use shows slightly lower performance (Batonon et al., 2015). 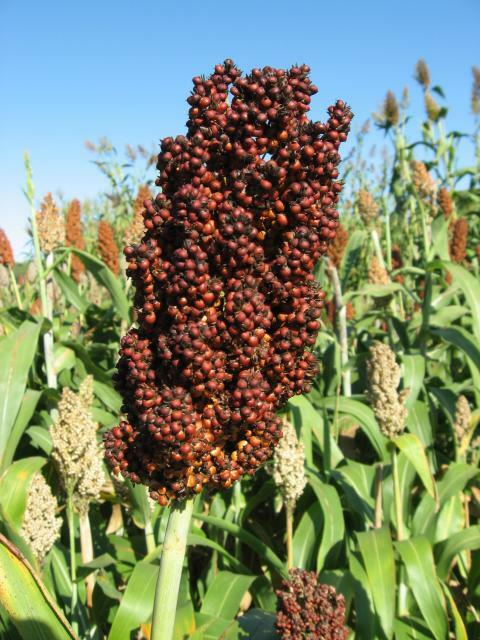 Tannin-free cultivars are preferred by poultry, but it is possible to feed them with high-tannin sorghum, provided it is reconstituted after high-moisture storage for 10 days. High-moisture sorghum is reported to have a higher protein digestibility and a slightly higher metabolizable energy. However, its digestibility remains lower than for low-tannin sorghum (Daghir, 2008). It may also be beneficial to add fat, methionine or to grind grain sorghum in order to enhance digestibility (Blair, 2008). High phytate content is also a problem because the unavailability of P reduces growth performance and can induce locomotive disorders. It may be counterbalanced by P supplementation or by adding phytase. The low level of xanthophylls (10 fold smaller than yellow corn) requires pigment supplementation in order to maintain egg yolk colour (Walker, 1999). High-lysine sorghum cultivars have been created, but while they have a higher protein digestibility, their starch content is lower and less available than in normal sorghum, hence reducing the advantages of the higher lysine on broiler performances (Elkin, 2002). Rabbits were fed with sorghum grain instead of maize with no deleterious effect on growth rate, feed intake and feed conversion (Carregal et al., 1980; Egbo et al., 2007). While low-tannin sorghum did not negatively affect rabbit performance, brown sorghum induced a lower daily gain and a poorer feed conversion (Muriu et al., 2002). This effect is attributed to the high tannin content of brown sorghum, which alters the activity of digestive enzymes and reduces calcium absorption (Al-Mamary et al., 2001). The digestible energy value of low-tannin sorghum is slightly lower than that of maize or wheat (Carabaño Luengo, 1995). The extrusion of sorghum grain improves the ileal digestibility of starch and may, therefore, increase its energy value and reduce health issues (Kazue Otutumi et al., 2005; Gidenne, 2000). Malted sorghum grains were used to feed growing rabbits in place of raw sorghum or maize grain, but malting did not seem to provide any technical or economical advantage (Abubakar et al., 2006; Ngele et al., 2008; Aderemi et al., 2010). High-moisture sorghum grain silage with either low or high tannin content may totally replace maize grain (25% in the control diet) in growing rabbit diets without depressing performance. Low and high tannin sorghum grain silages resulted in similar growth rates but the digestible energy of the low-tannin sorghum was slighty higher (17.9 vs. 17.2 MJ/kg DM) (Furlan et al., 2004). 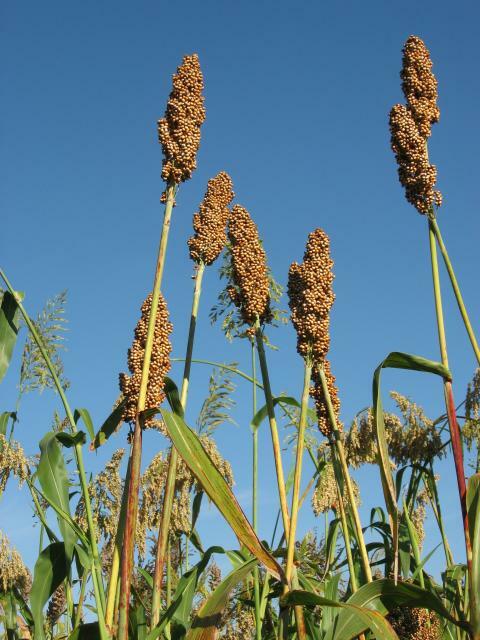 Like other cereals, sorghum is often used in aquafeed formulation and may be included at up to 50% in fish diets (Hasan et al., 2007), although it is less palatable than maize. Feeds made with sorghum grain are darker, denser and pellets do not bind as well as with maize (Lowell, 1998). Sorghum is valued in shrimp ponds (Hasan et al., 2007). Balole, T. V. ; Legwaila, G. M., 2006. 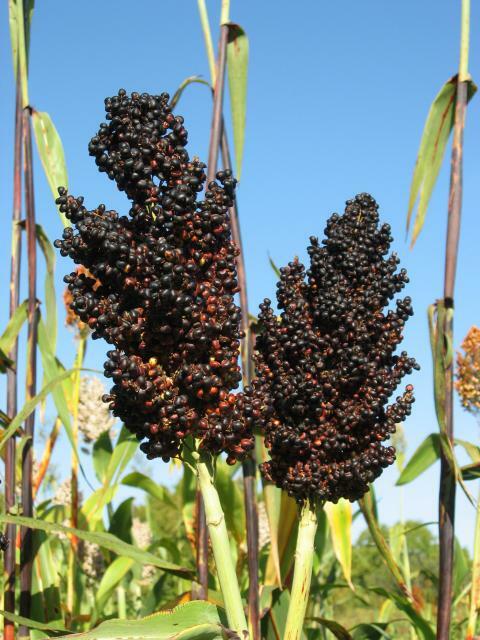 Sorghum bicolor (L.) Moench. Record from Protabase. Brink, M. & Belay, G. (Editors). PROTA (Plant Resources of Tropical Africa / Ressources végétales de l’Afrique tropicale), Wageningen, Netherlands. Carabaño Luengo, R., 1995. Valor nutritivo de los cereales en conejos. XI Curso de Especializacion FEDNA, Barcelona, 7-8 Nov 1995: 6 pp. Hamman, L. ; Dhuyvetter, K. C. ; Boland, M., 2001. Economic issues with grain sorghum. Kansas State University Cooperative Extension Service Publication MF-2513, Manhattan, Kan.
Hasan, M. R. ; Hecht, T. ; De Silva, S. S. ; Tacon, A. G. J., 2007. Study and analysis of feeds and fertilizers for sustainable aquaculture development. FAO Fisheries Technical Paper. No. 497. Rome, FAO. 510p. Tassin, J., 1989. Diversity of production systems from an agroforestry perspective. Results of a survey in a rural area of Rwanda. ICRAF: 74 pp.